U.S. All Islands Coral Reef Committee | A unified voice for the effective management of coral reef ecosystems in the U.S. and Freely Associated States. 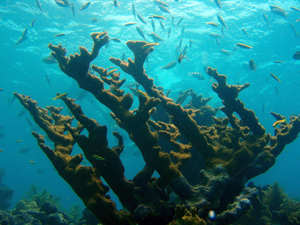 Elkhorn coral in the Florida Keys. Photo courtesy of NOAA. Hafa Adai, Talofa, Aloha, Hola, and Hello! Coral reefs, and their associated systems of mangroves and seagrasses, are the world’s most biologically diverse marine ecosystems. They are unique and complex ecosystems that support the cultural, social, and economic interests of the U.S. and Freely Associated States. The U.S. All Islands Coral Reef Committee (AIC) ensures coordination and cooperation within and among State, Commonwealth, and Territorial agencies, along with Freely Associated States. Working together with federal agencies and partners we are able to better manage and protect coral reef ecosystems for present and future generations. Learn more about who we are, here. For coral-related news and information, check out The All Islands Coral Reef Blog at http://allislandscommittee.wordpress.com/. Header photos courtesy of D. Burdick (Guam), Dr. Hector Ruiz (Puerto Rico), F. Castro (CNMI), B. Bishchof (Florida), C. Rogers (USGS; USVI), NOAA PIFSC CRED (American Samoa), and C. Fackler (NOAA ONMS; Hawaii).